Its been many nights and many days since I was here. Thanks to the three people who kept reminding me of the treasure I abandoned here…I appreciate you ladies. So, my soapmaking journey has mainly been about bar soaps but every now again someone will ask me about liquid soap…specifically for something a certain American Dr has been selling for over 60 years 😉. Introducing the Nini Junior Moisturising Castile Soap for babies and sensitive adults. It’s a simple clean formula with no unnecessary ingredients. For the sharp eyed ones among you 😁😁😁 you have also picked up on something significant. Nini Junior happened without much fanfare in december 2016 because Nini Body Treats has a lot going on and i didnt want the products in this babies-and-sensitive-adults range to get lost. Thank you for reading this far and I will be back soon. 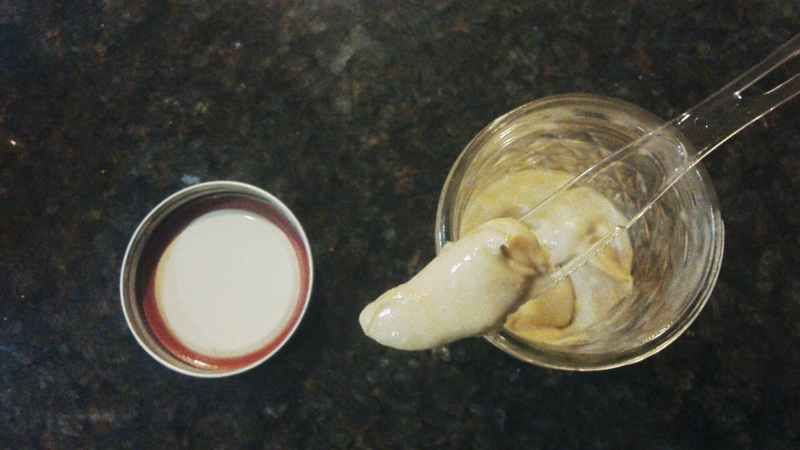 This post was inspired by finding a jar of thick lotion I made for my sister last year in one of her cupboards. It was a fragrance free cocoabutter lotion made with a strong calendula tea. Why? Although everything looked smelled and felt okay, it had passed the ‘fresh by’ date on handcrafted lotion (with preservative) that I’m comfortable with and its not always that nasties growing in product is visible to the naked eye. Especially if you live in hot, sticky high humidity areas like I do. Unlike commercially produced lotions which are usually no more than chemicals that help preserve the emulsion for a very long time and under stressful conditions, handmade creams are not meant to last forever. Also, unlike handcrafted soap which tends to get better with age (unless one or more of your oils go rancid) creams and lotions are best used up within 6 months. Some may last up to a year if kept in pump bottles away from direct heat, etc, but I would err on the side of 6 months and just make a fresh batch with active ingredients. I don’t often get the chance to make whipped body butter because I really don’t have any patience for the cleanup. If you have never heard of a whipped body butter, you are not alone 🙂 I’m surprised how often I’m asked to explain what it is. 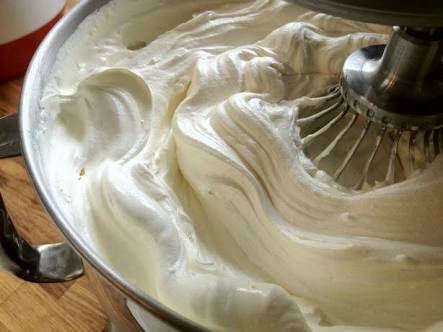 Its best to start whipping when the mixture is firm and cold but if that’s not possible, you can still impart beautiful fluffy melty texture to your whipped butter. It can be used all ovev the body and also in the hair based on the oils you add to the butters. Here’s half of a very recent custom order I made. I can’t tell you exactly what’s in it because the client supplied the recipe. But I can tell you its goooooood. Would you believe you are looking at just under 4kg of whipped butter?!! Thank you beautiful lady customer 😉 for the opportunity to serve your business. Hands down, the most popular question I get asked about soap is related to natural skin lightening. My answer is usually no. The essence of what I do is to create soap and other body products that are free of unnecessary chemicals. Even the fragrance oils I use pass strict standards and I can provide their MSDS. However, some customers have reported that since they switched to using real soap, they have noticed their skin getting lighter and more glowy (I don’t even know what that really means 😀 ) to the point that people they live and work with notice. Co/incidentally these soaps have milk and or yogurt included. I’m not a dermatologist but from my research, I can conclude that using products that nourish skin and are not chemical laden DO help the skin to regenerate and reverses the effects of sun exposure, which automatically leaves you one or two shades lighter than before! Of course you need to follow up with a moisturiser with sun protection and stay out of the sun (10am to 4pm) as much as you can to prevent further sun damage to your skin. Soap is a wash off product but it sets a good foundation for what you put on it. A dear lady who has been using my soaps for a while asked me to remake her 3 girls’ just finishing carrot soap. The basic moisturising recipe I make for young ones is this same for this soap but the star ingredients (in addition to kaolin Clay and Carrot) are Camwood and Chamomile extracts. Camwood is used traditionally for baby skin in my culture and chamomile is said to have soothing properties. 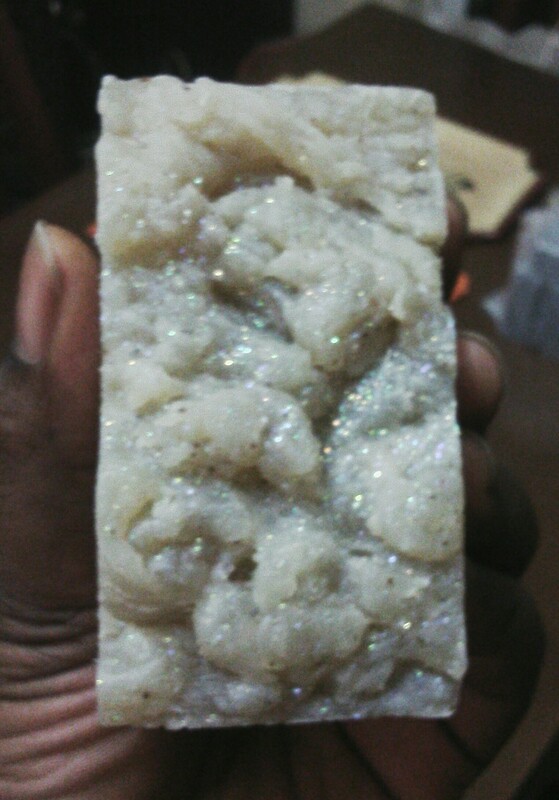 And because the soap is for girls, I couldn’t help adding some ‘diamond’ glitter on the top. One of the beautiful things about soapmaking is the creative expression it allows. Soap can be basic and functional, a work of art, or both. This definitely falls into the ‘both’ category. This particular recipe is targeted at people who want to even out their complexion and achieve a healthy glow. Want some? You can hook up with Funmi by email. Back when I was a wee lass I used native black soap because I had to. Even then I used to tinker with it because I wanted a soap bar that I could use directly on my skin. Fast forward a few decades and I’ve finally done it…well, sorta. 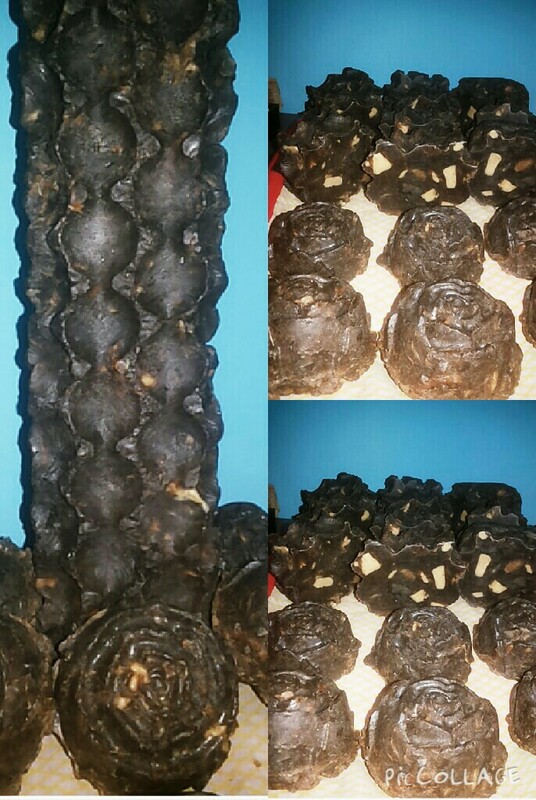 Where I’m from, black soap is made with Palm (/Kernel) Oil and Shea Butter, in addition to burnt plantain skin and cocoa pods. 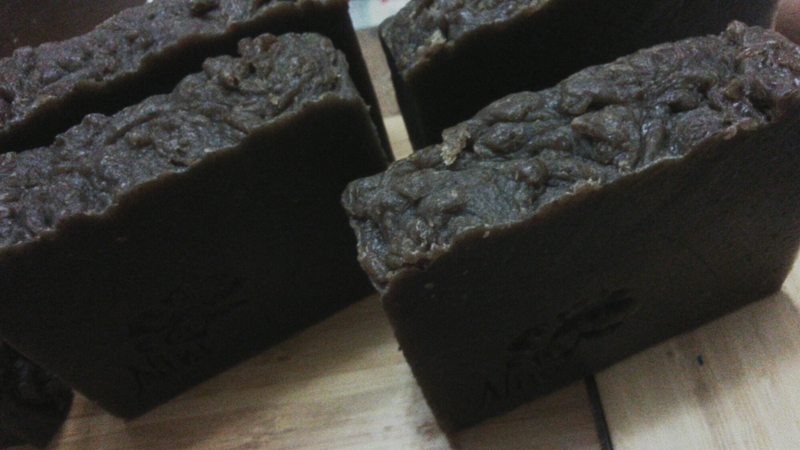 The resulting brown and black crumbly soap is always surprisingly gentle on the skin. My inner TinkerNini led me in 2 directions: cold/hot process and a clay blend. 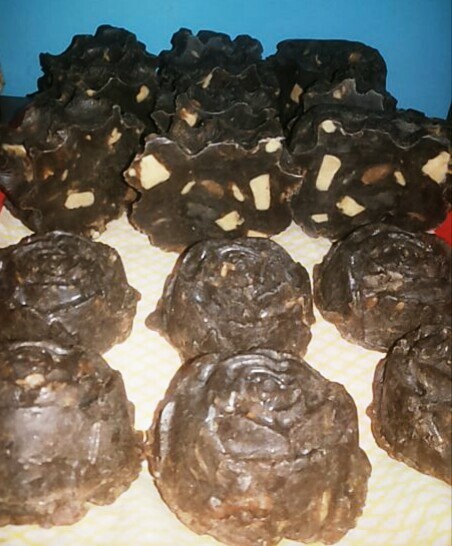 For cold and hot process, I used a recipe with PKO, Palm Oil, Shea and Cocoa butter (90%) and softened black soap and camwood at 10% of the recipe. 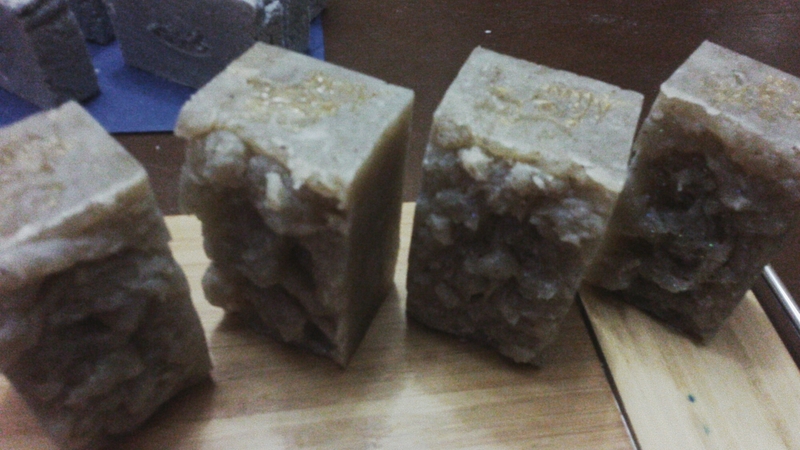 My PKO had been infusing orange peel for a couple of weeks and I also added orange peel powder into the soap batter. My great grandma would have protested but I added kaolin clay and honey also. The second route needed a little more elbow grease and I will blog about that another day.